William Aram was born on 16th September 1889, the eldest of the three son’s of William and Elizabeth Aram. The Aram family were living at Meadow Lane Chilwell in 1911 when William Aram senior was employed as a roadman for the local Council. William junior, then 22 was working locally as a nurseryman. his younger brother John (then 21) was working as a card puncher in a lace factory and the youngest, Harry (then 11) was still at school2. At the beginning of 1916, William married Dorothy Critchley and they set up home at 39 Dagmar Grove, Beeston3. On 20th October 1916 William Aram enlisted in the Army4 and was posted to the Leicestershire Regiment and on 29th November, embarked for India to join the 2nd Battalion who were stationed at Raniket, India as part of the Garhwal Brigade Meerut Division. At the start of the War, on August 4th 1914, there had been no fewer than 52 battalions of British infantry quartered in India and Burma (Mynamar), with 17 stationed in Bengal, 14 in the Punjab, 12 in Bombay, 6 in Madras, and 3 in Burma. It had been an immediate anxiety of the War Councils held in London to bring back as many of battalions that could be spared from the East. Before the end of September 1914, ten battalions of British infantry had left India, some of these proceeding direct to France with two Divisions of Indian Army Corps, others voyaging to England to join those Divisions which were being organised at home, mainly to be sent to the Western Front. Private Aram however, arrived in Bombay in March 1917, as part of subsequent reinforcements in India and remained there until November 1917 when he was transferred to Mesopotamian (Iraq) as part of reinforcements. He arriving at Kut on the 17th November 1917 but, a week later, he reported sick with a cough and was put on board the 'sick convoy steamer' PS58 for Baghdad. By then he had developed a temperature of 102°. He died of heart failure due to pneumonia at 10am on 28th November, while still onboard PS58. He was buried in Baghdad (North Gate) War Cemetery. The cemetery is 800 metres beyond the North Gate of the city of Baghdad on the south-eastern side of the road to Baguba.Baghdad. It is now located in a very sensitive area i n the Waziriah Area of the Al-Russafa district of Baghdad. The main entrance to the cemetery is located opposite the College of Arts and the Institute of Administration in Baghdad University and adjacent to the Iraqi Cigarette Factory in Waziriah Area and the Press of Ministry of Defence. Whilst the current climate of political instability persists it is not possible for the Commonwealth War Graves Commission to manage or maintain its cemeteries and memorials located within Iraq. Alternative arrangements for commemoration have therefore been implemented and a two volume Roll of Honour listing all casualties buried and commemorated in Iraq has been produced. 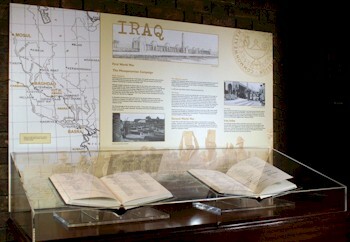 These volumes are on display at the Commission's Head Office in Maidenhead and are available for the public to view. The North Gate Cemetery was begun in 1917 and enlarged after the Armistice by the concentration of 2,975 graves from other cemeteries at Baghdad and in Northern Iraq and from the battlefields, and later from the cemeteries in Anatolia where Commonwealth and British Prisoners of War were buried by the Turks. At present 4,160 Commonwealth casualties of the First World War are commemorated by name in the cemetery, many of them on special memorials. The tomb of Lieutenant-General Sir Stanley Maude, who died of Cholera in Baghdad in November 1917, is in the middle of the Cemetery, and the memorial to the 13th Division which he commanded. 21911 Census : Piece 20822 RD434 SD4 ED1 Schedule 69. William and Elizabeth had then been married for 24 years. Another of their children had died in infancy. 6The pension would be worth just over £37 in today's buying power and about £182 relative to average earnings. The child has not been identified. 7This summary of Dorothy's subsequent life is based on available Birth, Marriage & Death indexes but has not been confirmed by sight of actual documents. However, it has been cross-checked against other records and appears to be reasonably reliable.